Chief Judge Jack Tuter, center, presided over four homeless cases on the first morning of community court in Fort Lauderdale. A new 'community court' program was launched in Broward County on Wednesday, after 10 months of preparation. The goal is to address the underlying causes of homelessness and prevent small crimes by diverting people to social services, instead of putting them in county jail. Chief Administrative Judge Jack Tuter and Judge Florence Barner will hear many as 10 cases every Wednesday in the Fort Lauderdale city commission chambers. They're joined by drug and alcohol rehab counselors and mental health and housing providers. Their first case was a drug-addicted man "in crisis," according to Tuter, who started to cry when speaking to the judges. "This is your village," Barner told him. "We will help you." The man was then referred to Broward's Addiction And Recovery Center, also called BARC, where he could get treatment for drug and alcohol addiction. Tuter admits finding housing will be the most difficult piece for those coming to community court. In another case, a woman was put on a two-week waiting list for housing assistance Wednesday. The 17th Judicial Circuit launched the program with the City of Fort Lauderdale and the help of a two-year, $200,000 grant from the nonprofit Center For Court Innovation. Some of that money will be used to pay for people who need ID cards, like a drivers' license, and bus passes. "Putting people in jail for, you know, sleeping in the park and panhandling we felt like was a very inefficient way to spend tax dollars," Tuter said. It costs an estimated $140 per day to house someone in county jail, according to the county. "We're trying to connect them with the service that meets their profile. What is it that you need? Why are you on the street?" Tuter said. For now, community court is only in Fort Lauderdale. Tuter said the 17th Judicial Circuit is planning to expand the program. "Once we get this off and going and see what works and what doesn't work, we do intend to expand it to other areas of the county," Tuter said. "One day in Hollywood, one day in Margate, one day in Lauderhill - and hopefully move the program forward." Anyone convicted of violent crimes or felonies is not eligible. Only small crimes, such as loitering, panhandling, and violations of other municipal ordinances are allowed to be seen in the program. All four of the first cases heard Wednesday were for violating Fort Lauderdale's open container ordinance. 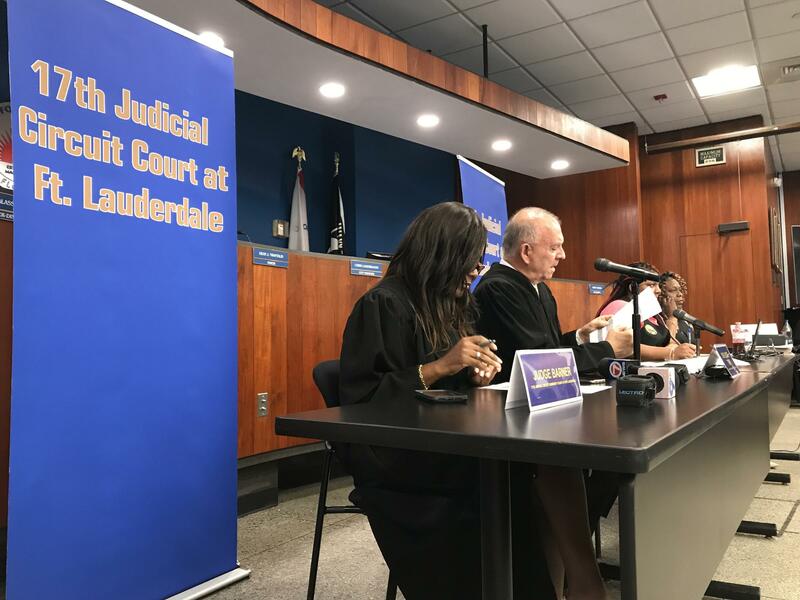 Judge Florence Barner, left, and Chief Judge Jack Tuter from the 17th Judicial Circuit will be presiding over six to 10 community court cases each week, in the Fort Lauderdale City Commission Chambers. Kevin Lee Yard told Judge Tuter that he has struggled with alcoholism, and tried treatment several times. He opted to try community court to find a place to sleep and figure out how to get a job. "I'm ready to go to work. But I'm willing to go through every length I can to get off the streets. You know, get shelter, that way I don't have to sleep wherever and get robbed," Yard said. In exchange for using the community court program, participants will be assigned 10 hours of community service around Downtown Fort Lauderdale, once they are healthy enough to complete it. The court connected Yard to a treatment center in Margate. His next step would be to enter a sober living home. After that, the organization called Opportunities Industrialization Centers of South Florida, or OIC, is set to work with Yard on job training. "I not only want it, I need it," Yard said. "I'm tired of being on the streets." This week, Broward County and Fort Lauderdale officials, along with business partners, cleared out a homeless camp in downtown Fort Lauderdale where about 80 people were living in tents. Monday morning there was a press conference to announce the "Home for the Holidays" initiative. By Thursday afternoon, all of the tents had been cleared out of the county Main Library's plaza. A fence and a sea of barricades were all that was left by Friday morning.